Daily Illuminator: The Cutting Edge Of Low-Tech Innovation! July 25, 2011: The Cutting Edge Of Low-Tech Innovation! With the arrival of convention season, it's tempting to start buying everything cool that catches your eye. Were you enticed by that 12-foot blowgun? Or that bamboo/sinew reflex bow? Or 350 pounds of almonds? If so, you must resist temptation! Just bide your time, and sooner or later all those goodies will be available in one spot for a low, low price. And by "sooner," we mean "now." 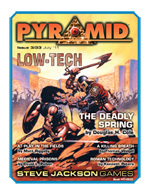 Pyramid #3/33: Low-Tech builds upon the foundation of GURPS Low-Tech and the three companion volumes, with lots of new add-ons and insights. For those who like their GURPS games crunchy, we have a complete optional bow design system that allows for a seemingly endless variety in premodern firepower (plus 13 ready-to-use bows and crossbows!). For simulationist gamers (and those who enjoy the "crunch" of almonds or other exotic crops), we have an expansion on the agriculture rules from GURPS Low-Tech Companion 3: Daily Life and Economics, written by Low-Tech co-author Matt Riggsby. For gamers who want to blow their enemies away -- low-tech style -- we have extensive GURPS rules on blowguns, including six sizes and nine ammo types. For folks who can't visit the past without getting in trouble, we have David Pulver's examination of medieval prisons. Finally, we have an overview on technology from the Roman Empire -- including nine "new" vehicles from the third century. Normally all these goodies would break the bank -- especially if you bought them all at once. (Do you have any idea what kind of paperwork and expenses stem from shipping just one 12-foot blowgun?!) However, you can get them all via one visit to e23 for the low, low price of $7.99. And if you subscribe, you can get this issue for even less. Shop smarter for low-tech, the high-tech way . . . with Pyramid!